Purchase a new sawblade from us and we will pay for the first sharpening within 6 months of the purchase date. We think our Sharpening Service is one of the best around. This Free Sharpening offer will give you an opportunity to see just how good they are. To see rates for blade and bit sharpening click here. 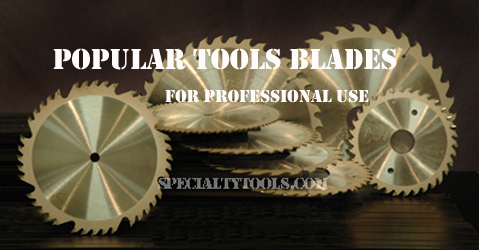 Popular Tools has been manufacturing high quality sawblades since 1989. As a maunfacturer they take pride in being one of the largest manufacturers of carbide tipped Popular tools sawblades . By controlling the complete manufacturing process they are able to maintain a consistent level of quality and performance offering you, the customer, clean cuts and long blade life. Over 90,000 circular Popular tools sawblades are there in three wharehouses across the US. According to OSHA standards, maximum safe cutting speed is 18,000 surface feet per minute,(SFM) when cutting wood*. This is the maximum safe saw speed but does not necessarily reflect the best saw speed. The most efficient results are usually obtained at somewhere between ½ and ¾ of the maximum speed. This will vary depending on the type of saw and the material being cut. The table below is a guideline. You experience may indicate the best RPM. Never exceed the maximum speed while using your Popular tools sawblade. *For aluminum and other metals the maximum safe speed slower.